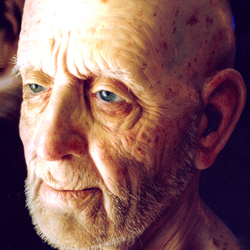 Character Make-Up | Ageing, Bald Caps, Hair, Prosthetic Materials and Ready-Made Prosthetics, available at Sunaura! 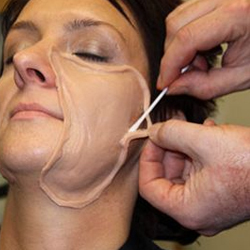 A soft, pliable fair-coloured wax used for contouring and creating scars, wounds and facial features.. This NSP Chavant Clay is a professional sculpting clay. NSP stands for Non-Sulphurated Plasteline-- ..
Made by Kryolan, the Glatzen Bald Cap is made from tear-resistant Glatzen Plastic, and is thin, but ..
Kryolan Glatzen L is a liquid synthetic material for creating your own ultra-thin bald caps.Instruc..
An absolute must-have for any hairstylist or make-up artist's kit bag, this professional Matte Lace ..
Kryolan's Cinewax is a non-sticky, pale wax with excellent adhesion properties. Can be used to block..
Kryolan's Gafquat is an extra-strong hair flattener, for use under bald caps and wigs. ..
Gelfix is a ready-made, clear gelatin product that can be placed in a cup of hot water to melt. Simp..
Great for creating your own bald caps, the Red Plastic Head from Kryolan has two different sizes on ..
Kryolan's Soft Putty is an easily-modelled, soft wax, designed for modelling facial forms on the ski..
Kryolan's Stipple Wax is ideal for simulation of an unshaven, five o'clock shadow sort of look. Com..
Maekup's Gelatine Flow Promoter is a cosmetic-grade solvent, designed to be added to Maekup Gelatine..
Maekup's Probondo is a chemically-modified Prosaide Filler, ideal for producing three-dimensional wo..
Maekup's Probondo Release and Seal is a rapid-drying solvent liquid, for use with Maekup's Probondo ..
Mouldlife's Lifecasting Alginate is a super fine alginate that offers a smooth, lump-free consistenc.. This thick Cream Adhesive from ProsAide is brilliant for filling in seams and gaps in appliances, an..
With great adhesion, water-resistance and flexibility, ProsAide No-Tack has all the great properties..
WM Creations Spirit Gum is the mostly widely-used spirit gum in the industry, and is used for the ap..
Tame your stache with Captain Fawcett's incredible Expedition Strength Moustache Wax! Housed in a sc..
Knotting Handles are used in the making of wigs. 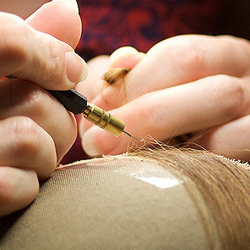 The knotting needle is attached to the handle and t..
Knotting Hooks, also called ventilating needles are used in the making of wigs. They are used to pic..
Kryolan's Gel-Foam is a gelatin foam used to create small facial appliances that look like human ski..
Kryolan's Moustache Wax is great for doing old-fashioned styling on beards and moustaches. .. This Kryolan Pre-Impression Bald Cap is a very thin glatzan bald cap, designed for use with life-cas..
Super Baldiez is a great product from Mouldlife which can be used as Bald Cap Plastic (so you can ma..
Super Million Hair is made from vegetable fibres, and can be used to add volume to, and cover, thin ..